Sounds enchanting, and it is. 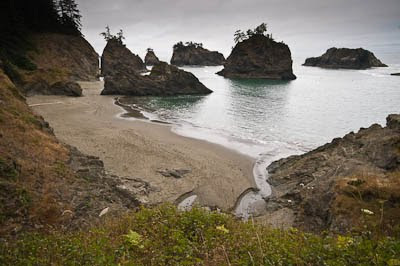 The longer trail to Secret Beach is a pleasant walk through the coastal forest. Judging by the amount of maidenhair ferns, it stays pretty damp along this trail. 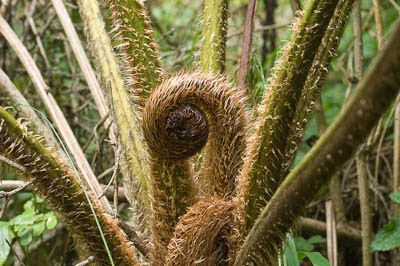 Just before entering the beach, you are greeted by the creek, and this unbelievably huge fern. The fiddlehead getting ready to burst forth is larger than a clenched fist. The fronds were over 10 feet (!) in length. Very impressive. The view of the beach from above is also impressive. 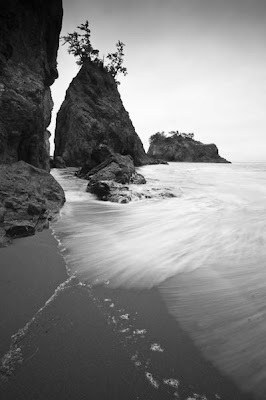 There is a short rock scramble to get down to the beach, which can be seen on the right side of the photo below. It's steeper than it looks here. 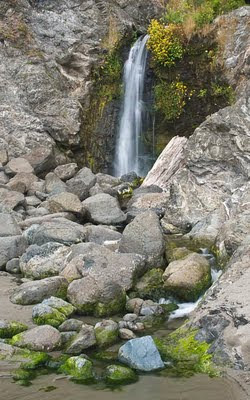 Once you are on the beach, you are greeted by a pleasant waterfall. Yellow Monkey Flowers adorned the right side. Using a 6 stop Neutral Density filter, I was interested in capturing wave action with longer exposures. This photo is at 1/6 of a second.Wanted to retain some of the wave "structure" instead of it being smoothed more by longer exposures. The fog stayed around for the most part the entire time. Other smaller creeks were also interesting, and the area south of beach looked like it would be accessible at low tide. No question about returning to this very special beach.